KIEV, Ukraine -- Viktor Yanukovich became the president of Ukraine promising a rapprochement with Russia. He has certainly delivered one. 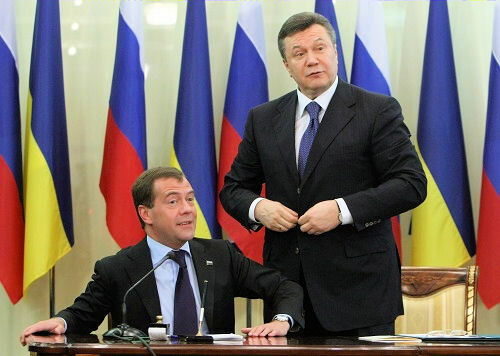 Dmitry Medvedev (L) and Viktor Yanukovych. The deal Mr Yanukovich has just signed with his Russian counterpart, Dmitry Medvedev, represents a decisive break with the policies of his predecessor, Viktor Yushchenko. By allowing the Russian navy to extend the lease over its base at Sevastopol in the Crimea, he has effectively torpedoed Ukraine’s pursuit of Nato membership. The alliance’s rules prohibit any member nation from hosting foreign bases on its soil. True, membership of Nato was already looking an increasingly distant prospect for Ukraine. The alliance backed away from offering the country a road map to entry at its Bucharest summit in 2008. Russia’s assault on Georgia later that year reduced further Nato’s appetite for sheltering more former Soviet states under its umbrella. But the deal kills any hope of accession. And it tilts Kiev eastwards in other ways, offering Russia economic concessions that Moscow can hope to transform into lasting influence. Mr Yanukovich has quickly put his stamp on foreign policy, cosying up to Russia rather than returning to the norm of balancing between the west and Kiev’s former colonial master. Mr Yanukovich’s price harks back to an earlier period of backroom deals by Kiev. He has traded the concessions in return for cheap gas. This may be popular at a time of economic hardship, but it is a retrograde step. It perpetuates Ukraine’s dependence on cheap Russian energy, thus leaving Moscow with a powerful lever in any future disputes between the two countries – one Moscow has shown itself more than willing to use. The only way to break this would be for Ukraine to pay the full price. That Mr Yanukovich has gone down this route is disappointing, but it is not wholly surprising. He has always looked more comfortable in Moscow than in Brussels. Mr Yanukovich can also argue that he has been driven by economic necessity rather than ideology. Ukraine is still reeling from an economic collapse that sliced 15 per cent off output last year. It is only six years since the Ukraine’s Orange Revolution opened up the possibility of faster integration into the European Union and membership of Nato. That momentum has been dissipated by the incompetence of Mr Yushchenko’s presidency. Yet most Ukrainians still see their future in the EU. Mr Yanukovich’s deal has made the achievement of that aspiration less likely. Fair comment,I resent the tilt towards Moscow because it increasingly looks like Ukraine does not have its own right to exist or as the old biblical say goes...Here! (Russia) let me give you (Ukraine) a bowl of hot lentils in exchange for your kingdom!